When you think of Amsterdam you may think of canals, drugs and legalised prostitution, but this vibrant and exciting city is much more than this. Amsterdam is also a place for food lovers, health conscious individuals and vegetarians. This month I visited Amsterdam for the first time and I was impressed by everything it had to offer. Here I summarise the main highlights I experienced when it comes to healthy eating and well, healthy drinking. It wasn’t long before I realised you could get really nice smoothies in all kind of places within the canal ring. The first one I tried was in Bagels & Beans lunchroom. You will find Bagels & Beans branches dotted around Amsterdam and here you will find bagels with healthy fillings, soups, salads, freshly made smoothies and freshly squeezed juices. 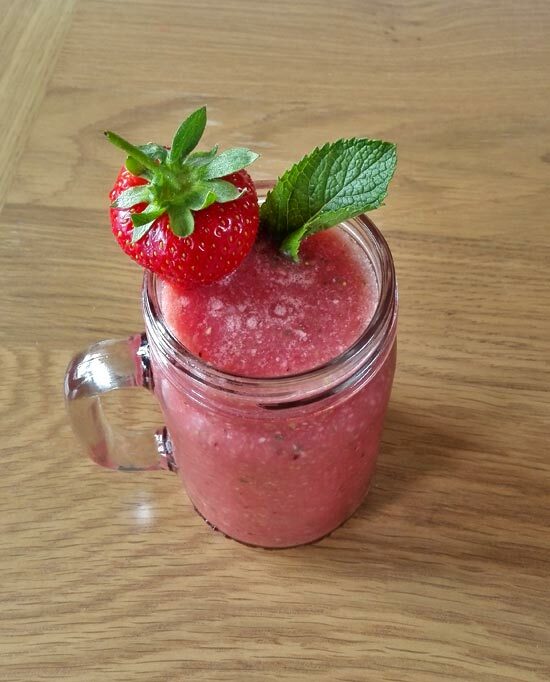 I really liked my Green Energy smoothie made with yoghurt, banana, strawberries and green powder. Another smoothie I tried was in central Amsterdam in one of the Lite/Dark branches. 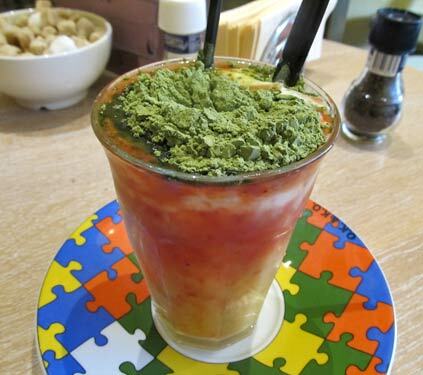 It was a veggie smoothie and not that sweet but very healthy! In this place they were also selling wheatgrass shots for 2 euros and I was watching them feed the wheatgrass into the machine which then came out as a liquid health drink. 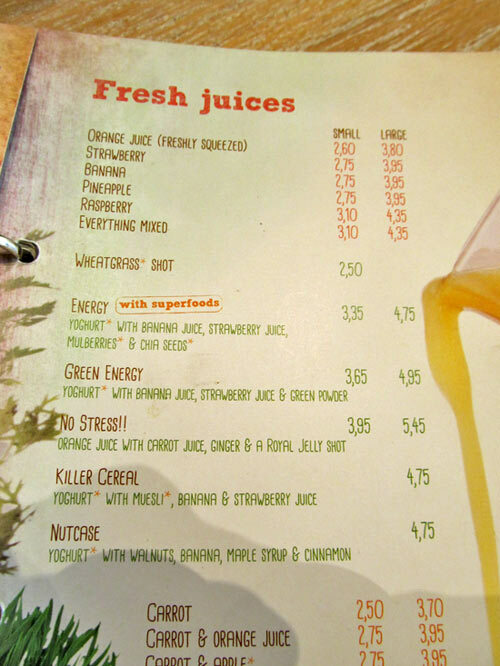 What was also great in Amsterdam was that you could have freshly squeezed orange juice almost everywhere. When me and my boyfriend visited Albert Cuypmarkt we bought a glass of freshly squeezed orange juice for 1 euro which we shared together. It was delicious. 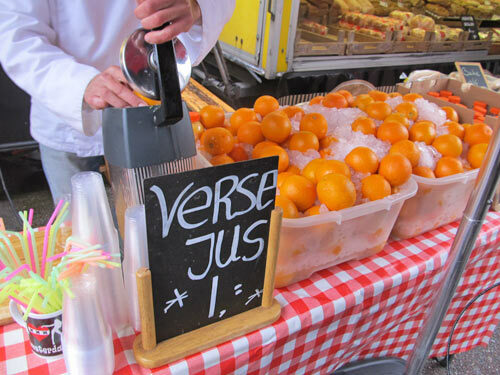 In some supermarkets you were able to freshly squeeze orange juice yourself by using a special machine. You just took a bottle of a desired size, pressed some buttons and machine would do all the work while you waited for the juice to come out. Once filled you would pay for it at the checkout. Impressive! I didn’t try it but I found it fascinating as I haven’t seen it elsewhere before. 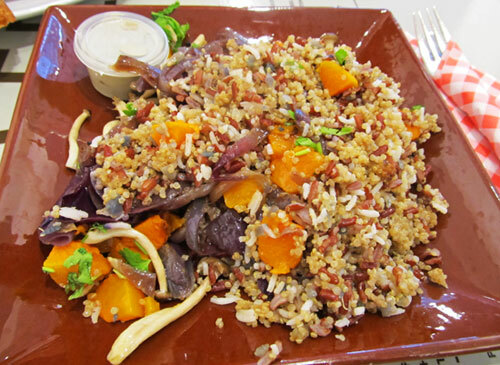 It was on a first day when me and my boyfriend went to a vegetarian café for a healthy lunch. They seem to have a bit unusual system but one that is easy to get used to. 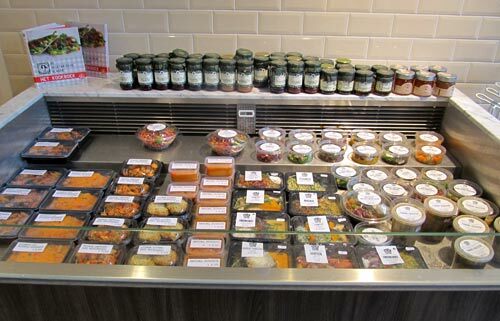 They have a fridge with healthy ready made meals such as salads and soups, all packed in plastic containers and if you want to eat something you just choose it and take it to the counter. They will put it on a plate for you and heat it up if necessary. They bring everything on a table while you wait and you pay at the end. My boyfriend had a chickpea salad with some unusual ingredients which I didn’t like as much. In central supermarkets the choice of healthy meals to take out for vegetarians was vast comparing to the UK. There were also other cafes with a good selection of vegetarian foods. I also noticed a chain vegetarian takeaway, called Maoz. I saw they had pitta bread, falafels, fried aubergine and different vegetables to fill your takeaway with. It’s kind of like Subway, only that is vegetarian. 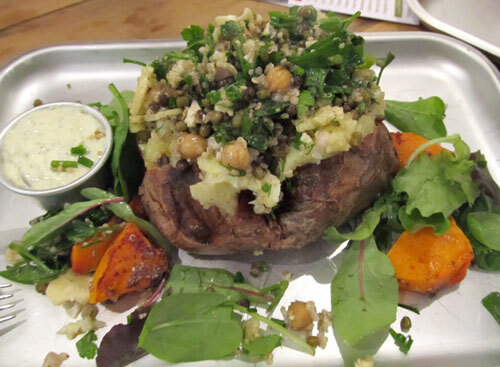 We’ve also been to a place called Jacketz where they sell massive jacket potatoes with healthy fillings, vegetarian and non-vegetarian. I chose to have a jacket potato with whole foods salad and garlic sauce. It was nice and very filling dinner, but most of all very affordable! 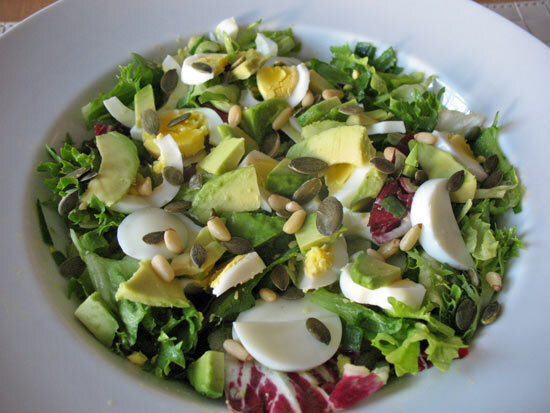 You will no doubt have no problems finding places with healthy foods to enjoy in Amsterdam. I wanted to visit some other places I found on this blog but there was no time. However, it’s worth checking it out. Amsterdam was such an inspiration to me when it comes to healthy eating and in the future I will try to incorporate the ideas I got from it into my meals. Have you been to Amsterdam before and what experience have you got when it comes to healthy eating in Amsterdam? Snap – Bagels and Beans was one of our favourite lunch spots when we went! 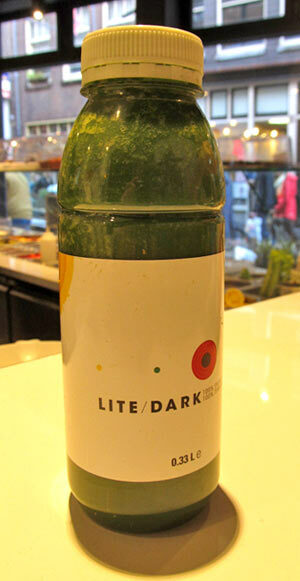 I have never seen olive oil in a smoothie until I went there… so cool! I also loved that everywhere served fresh mint tea – so good! It’s good to hear we’ve been to the same place! 🙂 When it comes to healthy living Amsterdam is ace. Thanks for the comment!